The SIERRA is a light, integrated, full carbon electric mountain bike offering aggressive power, great range and a sleek design. Take over any terrain. The SIERRA's frame is engineered to be light and robust while smoothly integrating all its electronics. Combined with a powerful mid-motor, a high performance battery, two Shimano chain rings and 9 speeds Shimano gears, it is lighter, easier to handle, more comfortable, faster and more energy dense than most electric bikes on the market. The SIERRA is the perfect bike to dominate any terrain with style. 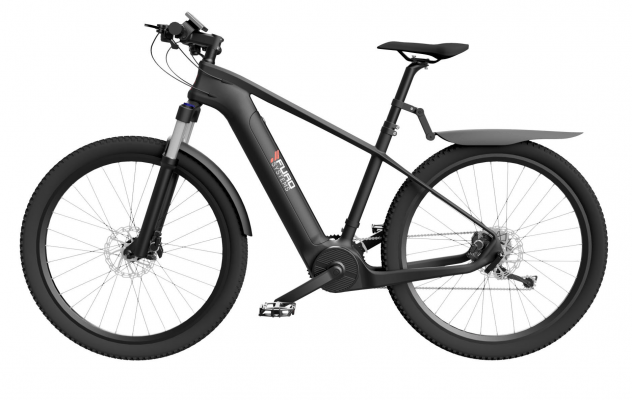 It is a truly high end ebike brought to you at an affordable price through modern technologies and world class engineering. The SIERRA's full carbon frame is manufactured using state-of-the-art aerospace technologies and integrates its battery, motor, wires, cables and electrical components perfectly. Its light weight leads to great manoeuvrability, enhanced range and optimal comfort. With more than 600W peak power, the SIERRA's high performance torque sensing BOFEILI 350W mid-motor feels exactly how much pressure you are applying on the pedals and reacts accordingly by providing you with enough power to transform you into a record breaking Olympic athlete. We assemble the SIERRA's removable Lithium-ion battery with the best cells available on the market, the same ones as those used in a Tesla Model S. The result is an incredibly light and compact 375Wh (or 500Wh) battery. See how fast you're going, how far you've ridden, your live battery capacity, average velocity and current power consumption. Choose between 5 pedal assist power modes: transform your SIERRA in a classic mountain bike or a full power all-terrain machine at the touch of a button. The walk assist mode gets you a solid initial boost of 6km/h and makes your high gear starts smoother. We equipped the ultimate ebike with the ultimate stopping system. Shimano M315 Hydraulic Disk Brakes provide long-lasting and powerful braking for the most agressive riders in the most extreme conditions. The SIERRA's powerful mid-motor is coupled to 18 Shimano gears distributed through 2 Shimano chain rings and 9 speed Shimano gears. This leads to outstanding torque control, range, speed and hill climbing. Fly downhill, slash mountain trails and own the park with the SR Suntour XCM front suspensions w/ Lockout. The SIERRA magnifies your speed and strength. Rediscover cycling and take on any terrain effortlessly. With more than 55km (or 75km) of range, never run out of steam, even on your most daring adventures. Optimise your ride with the SIERRA's onboard computer. Monitor your travelled distances, average speeds, power consumption and battery capacity.